Addie's father promised that she would learn to read and write her name. But when he doesn't return from the Civil War, it seems as if Addie's dreams might be lost with him. The war has been hard on the whole country, but it has devastated the South. It is a struggle for Addie's mother to find food for her children. Finding the money for desks and books for their education seems impossible, and she tells them that they'll have to wait. But Addie doesn't want to wait. She pleads with her mother to help find a way to make good on her father's promise. 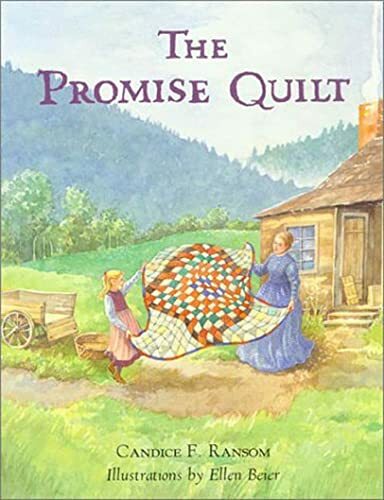 So Addie's mother uses her skill to craft a beautiful quilt which, with the help of a friend in the North who can auction it for them, will pay for the new school supplies. But not before Addie must decide to sacrifice something she treasures for something she so longs for.A poignant Civil War tale told from the Southern perspective, Addie's story is sure to make its mark on the hearts and minds of all who understand and share her thirst for knowledge and self-realization. called "an unusually moving story." She and her husband, Frank, and their cat, Xenia, live in Fredericksburg, Virginia. Ellen Beier has illustrated many books for children, including Mrs. Peachtree and the Eighth Avenue Cat and The Blue Hill Meadows. She grew up in New York and now lives in Corvallis, Oregon, with her husband and son. Grade 2-4-Addie's father promises her that when she is older, he'll send her to school. Then he goes off to war, serving as a guide to General Lee, and never returns. Addie, her mother, and her brother struggle to survive in the war-ravaged South, with only Papa's red flannel shirt to comfort them. When the time comes for Addie to go to school, she is dismayed to learn that the school has no supplies. Mama decides to make a quilt to raffle off and Addie gives up her father's shirt when her mother needs more fabric to complete it. The proceeds from the raffle are used to buy books and other materials, and Addie believes that Papa, in his own way, has kept his promise. This realistic tale, told from the point of view of a Southerner, is very touching. Like the pieces of the quilt, historical details are seamlessly interwoven in the story, bringing to life a very troubled time. Themes of resiliency, sacrifice, and hard work rewarded are gracefully woven into the narrative. Detailed illustrations give the flavor of the times with soft pastels complementing the tone of the story. Use this book with Patricia Polacco's Pink and Say (Philomel, 1994) as supplementary picture-book material for Civil War units, or use it alone as a good story of a family's values.